Thanks to Robert Hoare for his help and assistance in transporting the little boat ‘Rumi’ to the River Thames in Eynsham Oxfordshire. Thanks to Ben at the ‘Fibreglass Shop’ in Brentford for generously donating fibreglass and assosiated material, to make good the boat! Also thanks to John and Anne-Marie from ‘Edge Sails’ who donated our main sail. The main sail has 3 reefing points allowing us to sail in a much safer way than the sail we originally had. Thanks to the community spirit of Brentford residence and local boat owners. 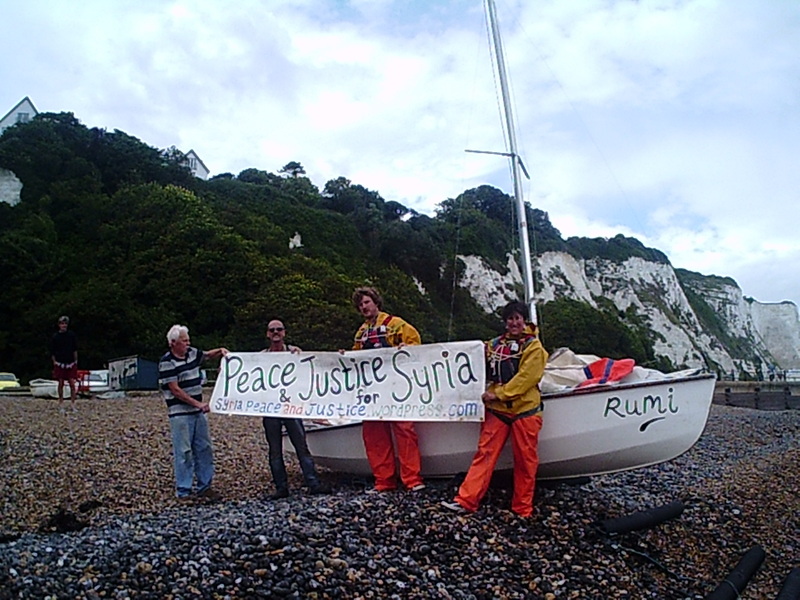 12th July – Official departure.Thanks to the great assistance from Chris Roper (East London Against the Arms Fair) and John Kenton who assisted in our launch from Gabriels Wharf, South Bank London. Thanks to all who came to see us off, friends and family. 13th July -Thanks to ‘Baraccuda Bill’ residing at the South Docks Marina. Also we need to mention a kindly concern from Ian and Ricky from a Port of London Authority vessel. Needed assistance from the Gravesend Sailing Club as our ‘centre board’ has become jammed and we are unable to drop the centre board for safe sailing. They volunteered the availability of their on-site crane. We were able to lift ‘Rumi’ out of the water. We discovered several chips in the hull which had to be repaired with fibreglass. The centre board was freed up and functioning well. Thanks to John,( also known as Fred ) Ron, Bob, Colin and all members of the sailing club who accommodated our presence in a noble spirit. 20th July – Gravesend to Queensborough, Isle of Sheppey. It was a beautiful day when we departed. On closing on Garrets Point the weather turned foul and we had to battle high winds and strong lashing rain. On heading towards Queensborough we had to take to oars as the wind suddenly dropped. We were very grateful to an offer of a tow from a French yacht and two kindly French ‘gentlemen’ Vive le France! Had to carry out essential repairs. Stayed on a galleon owned and built by Cap’n Lee who gave great advise and assistance and also breakfast! Thanks for shelter and assistance Peter, Sue and Jason! 29th – 31st July Ramsgate. Thanks to the help and assistance from the staff of the ‘Harbour Office’ at Port of Ramsgate. Thanks to Penny and Donna from the ‘Seamans Chapel’ who will be praying for us during our voyage. Thanks to the local community including Nigel and Neil who came to our assistance and who supported us during the time we spent at St Margarets Bay. We had to wait for a ‘good weather’ window for our attempt at the Channel crossing. 4th July Depart for Calais. At 3.20pm we departed St Margarets Bay. Said farewell the our friends Fred, Julian, Julie, and co. Escorted by Skipper Marcus and crew David, Richard, and Helen from the ‘Royal Cinque Ports Yacht Club’ thanks for your great help and assistance. Arrived in Calais safe and sound! Ravi de vous avoir croisés..alors que je n’avais pas prévu de rouler en vélo,n’y de passer par là..le hasard,cette péniche qui vous double,mon portable,les photos,le signe de la main,ce “changement de cap” pour me demander de poster ces photos sur FB.Si j’avais su je vous aurais offert juste quelques fruits ou boissons.